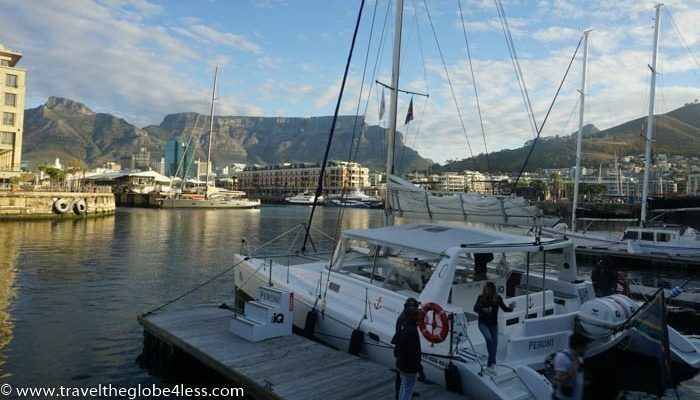 A great way to end an evening in Cape Town is to jump onboard a catamaran and head out to sea on a Cape Town Sunset Cruise. As you watch the sun setting on the horizon, you can take in stunning views of table mountain and Cape Town, whilst enjoying a few glasses of sparkling wine. 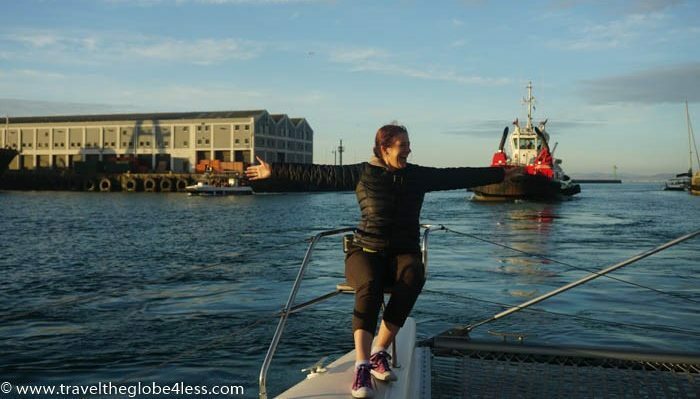 Seeing the city on a Cape Town sunset cruise allows you to savour the dramatic coastline. From the towering peaks of Table Mountain, Signal Hill and Devil’s Peak, to the splendid hulk of the 2010 World Cup stadium, this is a trip not to miss. We board our catamaran from the V & A waterfront, and start with a briefing from Faiz. Throughout the trip, he entertains us with his witty insight into differences between UK and South African English. Roundabouts in South Africa are known as circles, whilst traffic lights are robots. A barbecue is a brai and the local fish is snoek. From the galley, open windows call us to the nets. John and I giddily attempt to pose for photos, laughing raucously at our futile attempts to stay upright. Instead we face plant awkwardly into the netting, but it’s all part of the fun. From the sea, we trace the coast from the waterfront past Green Point and past the beaches of SeaPoint and Clifton. The views are utterly stunning and even though the skies are far from clear, the canvas is dramatic and moody. We sip on our champagne as the sun sets and the water slips beneath the netting. I expect to get soaked as the catamaran picks up speed, but it’s a calm evening and other than the sound of the hull slicing through the water, there’s not a hint of spray. As the sky darkens, streaks of orange merge with brooding grey clouds, and we catch sight of a shark fin. Faiz assures us it is not a shark, and whilst I am no marine biologist, I do know a big fish when I see one. We excitedly jostle for a better view but to no avail. Instead we admire a seal floating leisurely, joining us in our quest to soak up the last rays of the day. 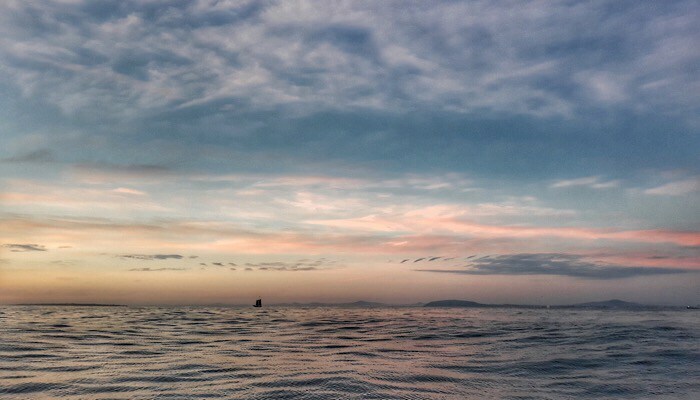 The sky turns a kaleidoscope of colours, and other sailboats join us to enjoy the view but all too soon, the sun slips into the inky depths and darkness descends. We return to the V & A to find entirely different scenes at night. The big wheel glitters from the dock, bars throng with holiday makers and entertainers attract crowds. It’s a great place to linger and enjoy dinner and drinks in one of the many bars and restaurants. We booked via Extreme Escape and tickets cost 450 Rand per person (approx. £22). If you get sea sick you may wish to take tablets beforehand. 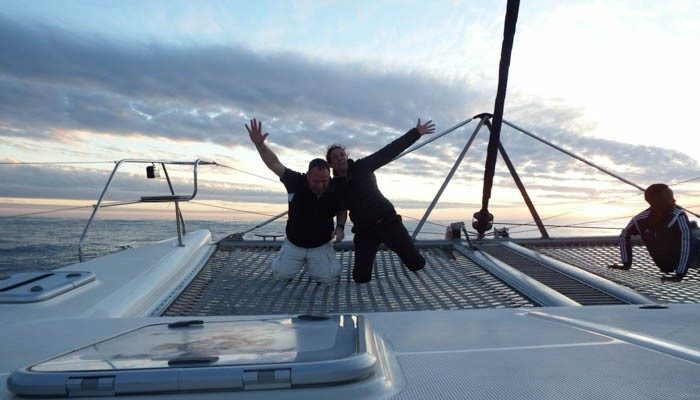 Although it wasn’t rough on our trip, one family were particularly affected and seasickness will ruin any enjoyment. 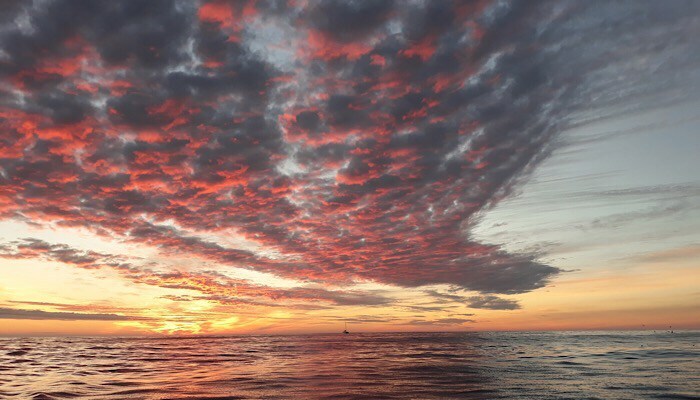 A Cape Town sunset cruise is a great way to spend a leisurely evening offering exceptional value and spectacular views of the coastline. My only slight disappointment is that we did push the catamaran to higher speeds, but considering how ill the accompanying family were, I do not blame the staff for keeping things gentle.